Hello! I spent my day off shopping with an old friend. Boy did I come home with the goodies! I found so many cute pairs of shoes and floral shirts, now I'm just ready for some warm weather so I can wear them! I hear it's gonna be in the upper 50's this Sunday. We'll see. Anyway, I made this card awhile back for another friend, but because I had so much 'girlfriend fun' yesterday, I thought I'd share this card today. It just screams 'GIRLFRIEND' doesn't it? The image is an old retired Stampin Up! set called, what else, but 'Girlfriends'. I simply stamped the large image on the side of a white panel and colored her with Copics. 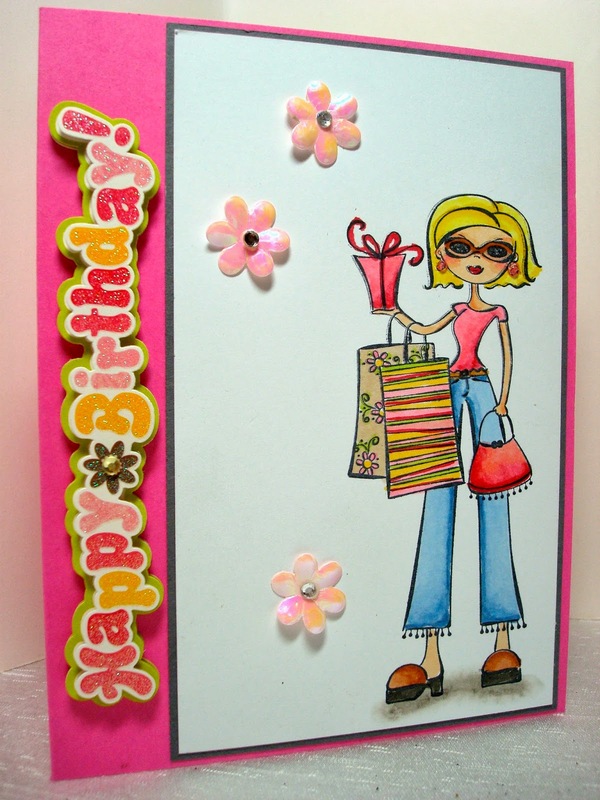 I added Stickles to her earrings and bag to glam her up a bit, then I sprinkled the card with pink sequin flowers and adhesive crystals. The sentiment is a 3D sticker by K & Co. Yesterday, was the first day in years, I actually spent time with a girlfriend 'just having fun'. I can't tell you how good it made me feel. I'm away from my house 'working or commuting' a minimum of 50 hours a week, so when I have a day off I'm usually crafting, blogging, doing household chores, gardening, or just trying to 'catch up'. Oh, and I am married, so I do have a husband that needs to see me once in awhile too. Because of all that, I really put my friendships on the back burner because I felt I didn't have time for them like I did when I was a SAHM. I know when life gets crazy busy, you have to cut some things out because you can't do everything, but to cut out having fun with friends, was a bad idea. It was such a great stress reliever just to get out, talk, laugh, and enjoy life instead of always working, working, working. Somehow, someway, I need to make time for more of this, even if it's just coffee or lunch once a month instead of an entire day. I didn't make any New Years Resolutions this year, maybe this should be one? A fabulous card Amy, I love the old SU stamps that they used to have! The sentiment sticker looks fantastic too, love that it's so colorful! Glad to hear you had a great day with your friend. 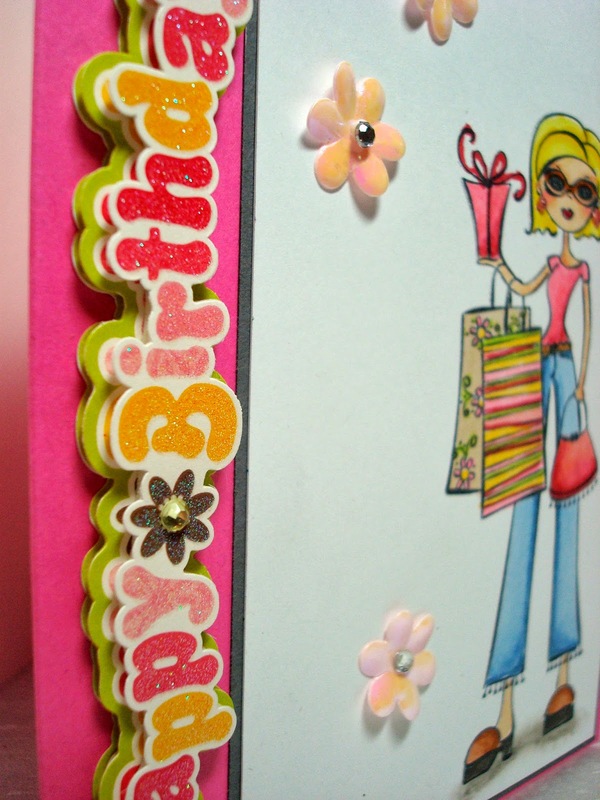 Oh love this card, so girly ! Love the sentiment ! and colors are beautiful ! Your card is darling, Amy! And, she looks just like you...so fashionable! Glad to hear that you took time for yourself, sweetie! We all need that from time to time. Thanks for sharing! This is fabulous Amy,love the image and the fabulous use of colour! Wonderful embellishments too!